OK, it's big and sharp... it's not a Bowie or a Dagger or a Hunter or a Camp Knife.... it's light & fast with a lot of cutting edge... it must be a Fighter. Here is a modified version of a piece I hadn't done in quite awhile but was asked to bring back to life. This is a variation of the traditional US combat knife. The blade is fully hardened and forged from 5160 high carbon spring steel with a 5" length, milled fuller and hand filed saw-tooth back. The guard on this piece mimics those on my G.A.K. Fighters and the threaded "hex-nut" pommel has a tapered skull crusher. The guard and pommel are high carbon steel and both they and the blade are treated with my "antiqued" finish for both corrosion resistance and non-reflective properties. The handle is black Canvas Micarta contoured and beveled on the ends to match the guard and pommel as well as being grooved to improve the overall grip. The overall length is approx. 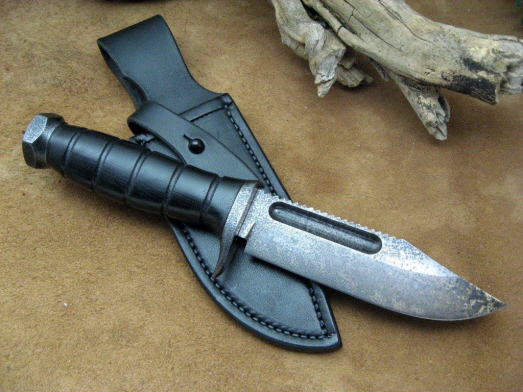 10" and this piece comes with a fully black sheath with belt loop and retention strap. This design is a tribute to Mr. Bill Bagwell. Since this knife works so well and can fit in either my Bowie or Fighter categories, I'm putting one in each section. This hidden-tang knife is forged from 2-bars of high carbon steel drill rig cable, forged together and twisted. 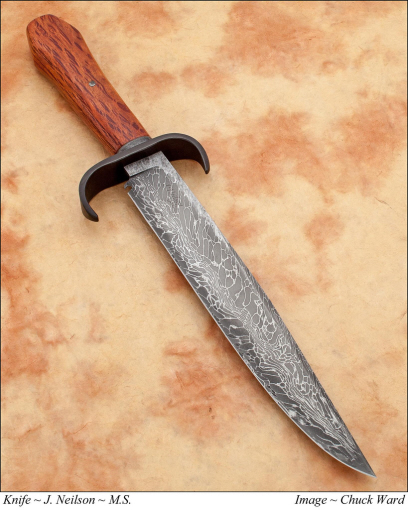 The blade is 11" with acid soaked/forge marked flats and a "Spanish notch". The cable damascus has a visible quench/hamon line as well. The double quillion guard is forged from carbon steel with my "antiqued" finish. The handle has a throat spacer of carbon steel, finished to match the guard and the handle itself is Australian Lacy She-Oak done in a "coffin" profile. The handle is finished off with a hammered and etched carbon steel set pin. The overall length on this piece is approx. 17" and this knife comes with a tooled leather sheath. This is a simple clean & classy medium Fighter. The blade is 7 3/4" forged from 52100 high carbon steel with a hand-rubbed finish. The contoured double-guard is nickle-silver with a black spacer in-between. The handle is A-grade Desert Ironwood Burl with a nickle-silver pin. The overall length of this piece is 13" and the knife comes with a plain "high-ride" blade sheath. These G.A.K. Fighters were spec'd out by Ole Gunny, for himself and his compadres. The specs and materials change a bit at times but, these are the two "standard versions" shown here. The blade on this Combat Version is 9" and forged from 5160 high carbon steel that has been fully-quenched. The top clip on the front of this blade has also been ground to a zero edge. The blade has been treated with my "antiqued" finish to resist corrosion and be non-reflective. The guard is low carbon steel that has been lightly blued. The handle is approx. 5" with a palm swell and made from Burlap Mycarta (mycarta made by L.R. "Butch" Harner) and is set with a stainless steel pin and lanyard liner. The knife comes with a leather blade sheath with loop and strap. The blade on this Presentation Version is 9" and forged from 5160 high carbon steel that has been fully-quenched. The top clip on the front of this blade has also been ground to a zero edge. The blade has a hand-rubbed finish. The handle is stabilized Flame Ebony wood with a guard, spacer, pin and lanyard liner of stainless steel The handle is approx. 5" with a palm swell and the knife comes with a leather blade sheath with loop and strap. This large Sub-hilt Fighter has a sweeping 12 1/4" blade forged from 5160 high carbon spring steel with a polished, hand-rubbed finish. The guard, spacer, sub-hilt and pommel are all stainless steel with a handle and spacers of African Blackwood. The "faceted" skull-crusher is also forged from high carbon steel. 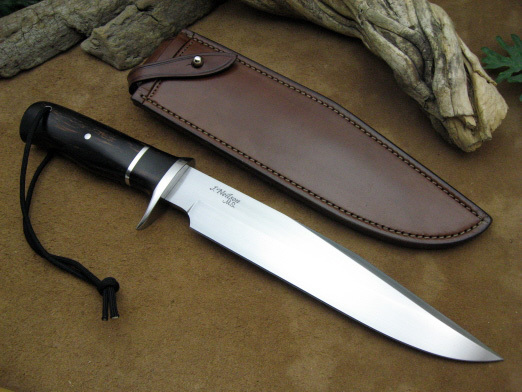 The overall length of this Fighter is 19 1/4" and comes with a tooled leather blade sheath. This big Fighter has a 12" blade of edge-quenched W1 high carbon steel with etched/forge marked flats and a nice, wavy hamon line. The handle furniture is forged from O1 & 15N20 random damascus with a large oval guard, fullered spacer and pommel filed to match the Sambar Stag handle. The overall length of this knife is 17 1/2" and comes with a tooled leather blade sheath. 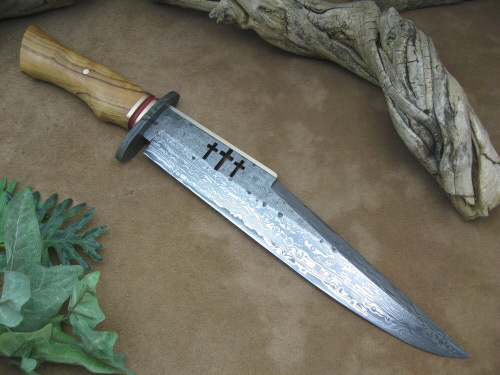 This "Trinity" themed Fighter has an 11 1/4" blade of "fireball" pattern damascus steel with etched/forge marked flats, a silica bronze back-bar and three crosses cut into the blade. The guard is a wrought iron oval with file work accents. The handle is stabilized Olive wood with a throat of silica bronze and fullered red spacers. The handle is finished off with a silica bronze pin. 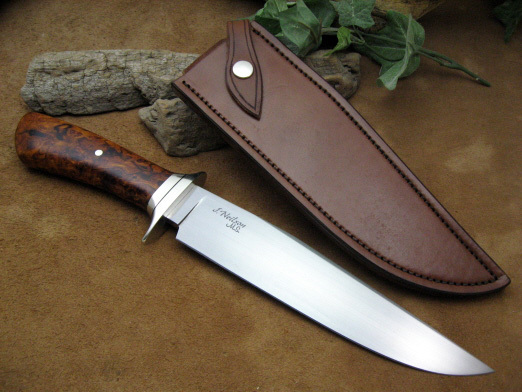 The knife has an overall length of 17" and comes with a tooled leather post sheath. This beast was one of my 5 Mastersmith test knives I produced for the ABS. 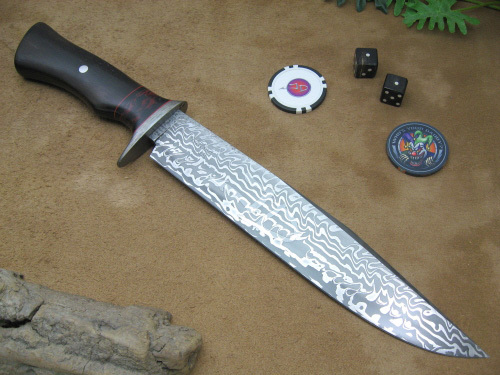 This Fighter has an 8 1/2" blade of 325 layer high carbon "breeze" pattern damascus steel. The fullered, oval guard, front spacer and threaded pommel & finial are all from the same billet of steel and are patterned the same as the blade. The 5 1/4" handle is stabilized A-grade Curly Maple wood and has spacers of .999 fine silver on each end. 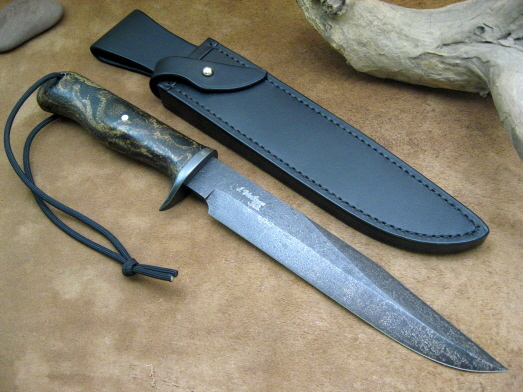 This knife comes with a fully tooled and exotic skin inlaid blade sheath. This fighter is my theme piece for the www.JerzeeDevil.com web site. The 9 1/4" blade is a bold "W" pattern damascus blade forged from 1095/15N20 high carbon steels with the JD logo "resisted" into both sides of the blade & with forge marked flats. The 1 1/2 guard is etched "jailbar" wrought iron. The handle is stabilized Ebony wood with spacers of Butch's (L.R. Harner) JD my-carta and red and back spacer to back it all then cinched up with a big 1/4" stainless steel pin. Piece comes with a tooled leather blade sheath. This piece was another of the 5 Mastersmith test knives I made for the ABS that I really liked. 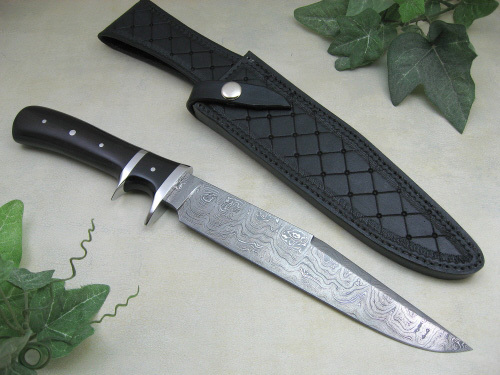 This slender and handy little Fighter has a 6" blade of 325 layer high carbon "ladder" pattern damascus steel. The guard-and-a-half and back spacer are etched wrought iron with a fullered black spacer in-between. The handle is stabilized African Blackwood and has a stainless steel pin. This knife comes with a tooled leather blade sheath and has an overall length of 10 3/4". 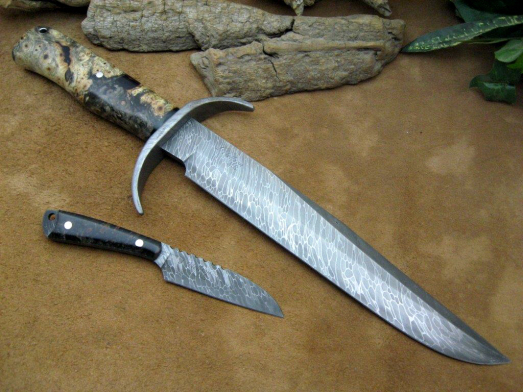 This fighter has an 8" blade of "ladder" pattern damascus steel. The knife has an overall length of 13 1/2". The handle is African Blackwood with a guard and sub-guard are nickle-silver and the pins are stainless steel. 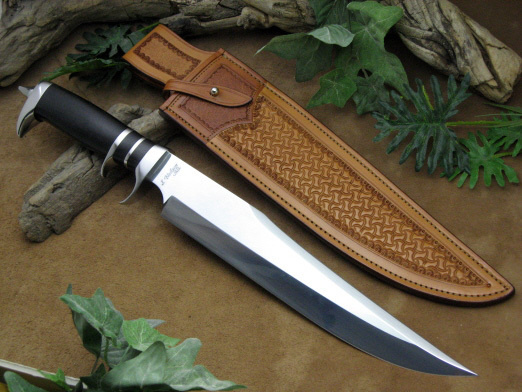 The knife comes with a tooled leather blade sheath done in a "Quilt" pattern with a loop & snap. This fighter style has a blade stylized after our "hawkbill" neck knives but, in more of a fighter size. 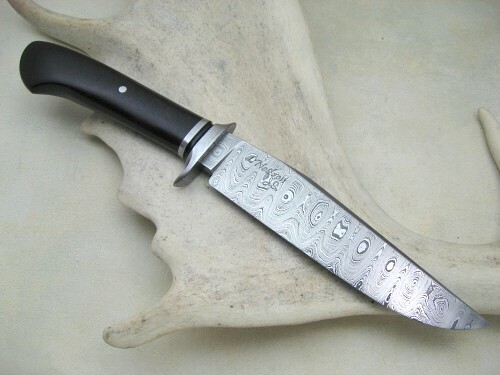 The blade itself is 7 1/2" long and made of 350 layer high carbon damascus steel. 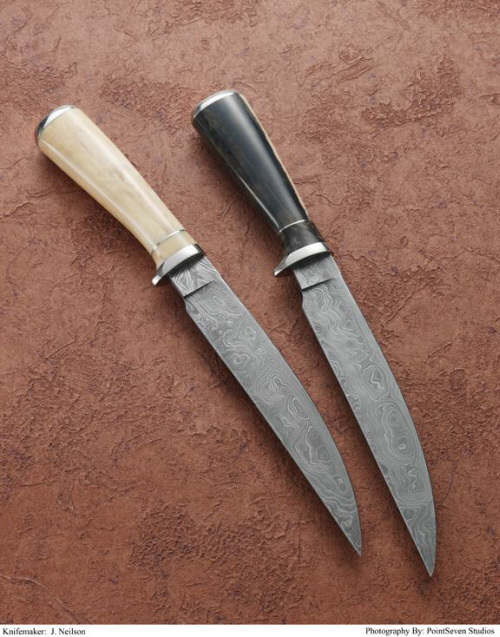 The handles on both of these knives are ancient Walrus ivory with a matching throats and nickle-silver guards, spacers and threaded pommels. Knives come with fully tooled or inlaid leather blade sheaths. 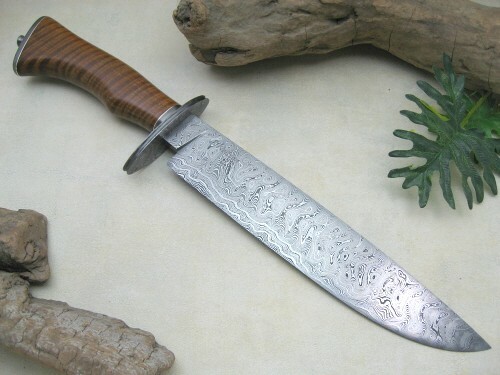 This full-tang Fighter has a 7 3/4" double ground blade of "river" pattern (canted ladder pattern) damascus steel with forge marked/etched flats and a file worked thumb area. The handle scales are stabilized Giraffe bone with black liners and three stainless steel handle bolts. 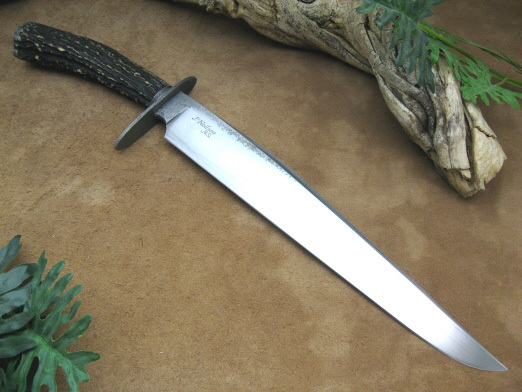 The overall length of this fighter is 13" overall and comes with a tooled leather blade sheath. This set starts with my standard 9" G.A.K. 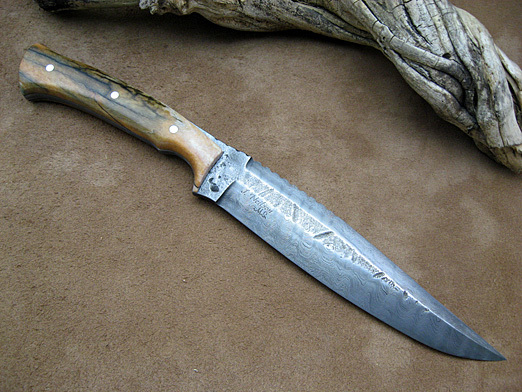 blade but, forged from high carbon steel "Drill Rig" cable damascus. This piece also has a double forward quillion guard forged from the same cable damascus. The handle is approx. 5 1/2" made from stabilized California Buckeye Burl wood with a black spacer. The handle is secured with a stainless steel pin and has a matching lanyard liner.The "side knife" is a full-tang, sheep-foot style forged from the same "Drill Rig" cable, approx. 6" (half blade/half handle) with a file worked thumb rest. The handle has scales of stabilized California Buckeye Burl (from the same blade as the Fighter above) and are secured with stainless steel handle bolts. The knife has an exposed pommel with lanyard hole.The set comes in a "Piggy back" sheath (both knives secured in the same sheath) done in fully tooled leather with a belt loop and has the extra security of inlain rare earth magnets.